Francis Vallat, originally co- founder and 1st Vice-President of the European Network of Maritime Clusters (ENMC), which was created in 2005 in his Paris office, and current Chairman since 2011, decided to resign from his chairmanship on the occasion of the annual meeting which was held in Elsinore, Denmark from October 25th to 26th. After six years at the head of the network, he thinks it is time to give a younger highly reputable maritime personality a chance to allow new ideas and blood into the ENMC. As a matter of fact it came as no surprise as the transition had been carefully prepared since autumn 2016, ie when Francis Vallat confirmed that his decision was irrevocable. 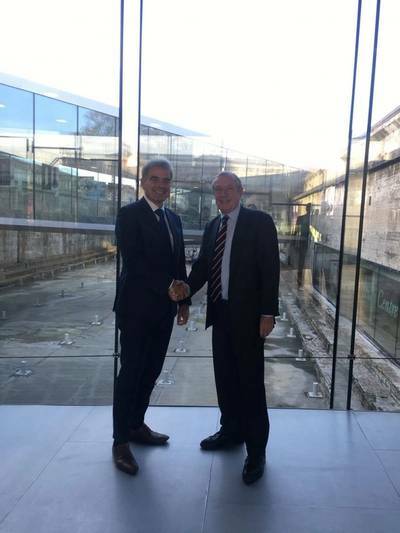 The former duo has been giving a strong new impetus to ENMC for years, multiplying efforts to better connect national clusters with each other on the one hand, and the ENMC itself with relevant international organizations as well as European bodies on the other hand. It established the ENMC as a well-recognized stakeholder, highly respected a.o by the European Commission and the European Parliament Maritime Intergroup. The ENMC members then elected the Managing Director of Nederland Maritiem Land - the Dutch maritime cluster organization - Mr. Arjen Uytendaal to the Presidency/chairmanship, and three prominent maritime leaders as Vice-Presidents: Spanish Maritime Cluster President Mr. Alejandro Aznar; French Maritime Cluster President Mr. Frédéric Moncany de Saint-Aignan; and Chairman of the Italian Association of Shipbuilders and Ambassador Mr. Vincenzo Petrone.